All I want to know is what has happened to our weather. Our averages are in the 50's this time of year. This morning the windchill was 29 degrees. If I wanted it to be 29 degrees, I'd move farther north thankyouverymuch. Not only was it frigid, it was gray. I know that there will come a point when I'll get out and run in this weather out of necessity (and for sanity reasons), but not ready to go there just yet. So, I took my run indoors along with biceps and back. I started with a warm up of 1 mile at a 9:13 min mile pace then moved into intervals* (my only saving grace for treadmill runs). I finished out the remainder of the run (about .8 mile) starting at 9:13 and gradually increasing pace every couple of minutes to finish the last 1 minute at 8:34. *Just to clarify - 2 mins at half marathon goal pace followed up 2 minutes at recovery pace repeated 4 times for a total of 16 minutes. Then 1 minute intervals totaling 8 minutes. Definitely felt this one in the biceps thanks to the EZ bar curls. Nice change up from the dumbbells, and I think changing to the bar for a bit will help me get over the weight plateau on the dumbbells. Next week I plan on increasing the bar load. I am still shocked at how much harder these seem vs the dumbbells. I know I shouldn't be surprised of course. But I still am. 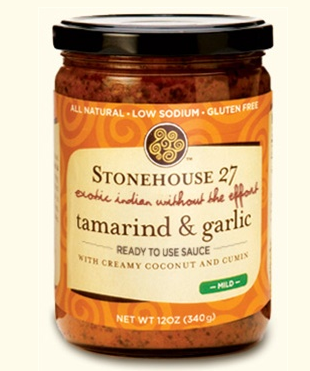 A while back I won a great giveaway from SpaBettie for Stonehouse 27 Tamarind and Garlic. What's great is that this sauce is both vegan and gluten-free. OH, and it makes for an incredibly easy dinner as well. For tonight's super easy dinner, I made some brown rice, making sure to make extras for future use (using my head for once). At the same time, I dry-seared some tofu then cubed it up. I went with carrots, yellow and orange bell peppers, and peas for the veggies. 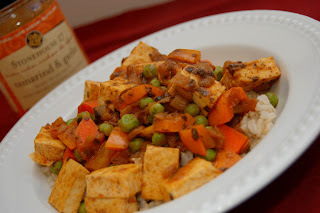 I simply sauteed the carrots and peppers until they were soft then added in the sauce, tofu and peas and let that heat up until the peas were heated through. Then served over rice. I could get used to easy weekday meals like this! Not only was it easy, it tasted fantastic. I will say that I almost felt guilty for using a pre-jarred sauce like this. But then I read my friend Tina's post over at Best Body Fitness. You know, pre-packaged isn't always a bad thing. If you opt for meals that have a healthy list of ingredients (like this Stonehouse 27 sauce), then why feel bad? Pair it with lots of veggies, frozen is a-ok, and a lean protein and you have a complete and healthy meal. Maybe pre-packaged or pre-jarred gets too much of a bad rap? Not saying we should all run out and by frozen dinners or boxed meals, but I think you see where I'm going with this one. Choose wisely, pull a Sandra Lee Semi-Homemade, and make life easier on yourself once in a while. Thoughts?